I've discussed in a previous post that I've recently stumbled across theories on the human condition by Jeremy Griffith that I believe provide new, interesting and [I'm finding increasingly] imperative discussion about what we should really do about saving the environment. He says the real need is for humans to understand themselves first and foremost, that our destructive natures are what we should be researching and solving and not environemental issues. As he says at the World Transformation Movement "Environmental problems are promoted everywhere as the great 'Save the World' issue, BUT the truth is we have only been focusing on the symptoms not the cause of the devastation of our world and the disintegration of society that is happening everywhere we look, which is us humansour egocentric, competitive, selfish and aggressive behaviour". I agree wholeheartedly, however, while humans remain destructive and unaware of a solution and a change that can be made now via these new ideas I think we do still need measures to curb our behavior. One such method is with wind turbines, which I will discuss below. Solar power is no new phenomenon, although given Congress's approach to renewable energy, you could be forgiven for thinking that it was still some sort of "social experiment", not a world saving phenomenon. Solar power still provides less than 1% of all energy needs in the USA, while our population consumes over 25% of the world's energy. But it needn't be so. According to the US Department of Energy, "the solar energy resource in a 100-milesquare area of Nevada could supply the United States with all its electricity". In fact, the earth receives more energy from the sun in 24 hours than the whole planet consumes during one year! Eternal frustrations continue at the inaction of our Governments, even as the self evident implosion of fossil fuel dependent societies happens before their eyes. But despite The White House's seemingly unyielding love affair with oil, there is a growing fraternity of solar savvy Americans that have turned on to the environmental and economical benefits of renewable energy for their homes. Every year for the last 15 years has seen a 30% rise in demand for solar power. According to The American Solar Energy Industries Association, California is currently the leading solar power state in the USA in terms of solar system installations and solar power generation, thanks largely to a rebate known as the California Solar Initiative. But its progress reaches beyond the states reputation for technological development, entrepreneurialism and liberal philosophies. California, if nothing else, is known for one thing more than any other. And it's the key ingredient required for embracing solar energy - sunshine! After all, it's not called the Golden State for nothing. So it raises the question, if you don't live in California, but instead (for better or worse) inhabit some of the more cloudy or colder corners of the nation, then how can you contribute to saving the world, rather than accepting the default fossil fueled destruction of our planet? 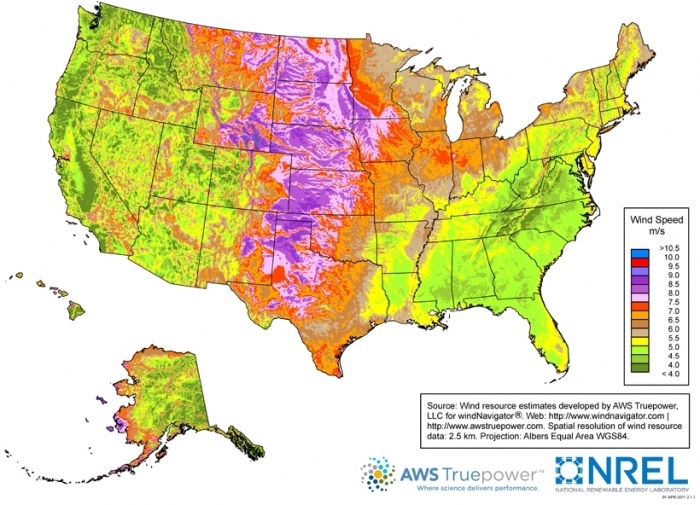 Well the answer may lie in America's emerging residential wind turbine industry. The origins of wind begin with the uneven heating of the Earth's surface by the sun, and the interaction of the colder air and warmer air, causing wind to 'blow'. For years, farmers have used windmills to harvest this natural and somewhat obvious force, driving bore pumps to tap into underground water resources. Man for thousands of years has tried to find ways of "roping the wind", and it wasn't until the 1970's that science and industry really got going, when the emergence of wind farms as a viable alternative to fossil fuel power began to gain momentum. According to the American Wind Energy Association (AWEA), the worldwide wind energy produced each year is enough power for 6 million American. homes, with America producing a little more than a quarter of that amount. That's heading in the right direction, considering the statistics above which relate to America's consumption of 25% of the worlds total energy. Somewhat surprisingly, the winds of change are blowing in some unexpected places too. The long held image of Texas as an 'oil or bust' state may require some reconsideration. AWEA statistics identify Texas as being home to twice as much wind turbine infrastructure as any other state (AWEA, 2012). As shown in the map below, Texas is sitting at the bottom of the nations most prolific wind trough - a belt of land that runs from Montana and North Dakota all the way down to the Lone Star State. The largest state on the mainland has embraced its climatic conditions despite it's abundance of natural fossil fuel deposits." But it's not just commercial power generation that is seeing a viable economic resource in wind power. Like their country cousins, America's urbanites are beginning to reap natures benefits in parts of the country that have the wind consistency to support it. Given the economic difficulties many households are facing, and the growing community sense of responsibility for climate change, self-generation of power for the home is proving to be a real cost saving incentive. This trend has not gone unnoticed by Bergey Wind Power Company, the world's leading supplier of small wind turbines with installations in all 50 states and more than 90 countries. Company President Mike Bergey has seen a rise in residential sales and attributes it largely to a shift in the way some Americans are approaching their energy costs. 'Thousands of homeowners across the country are using a Bergey wind turbine to drastically cut their electric bills'. Those generating enough power are even turning their turbines into money makers, by selling energy back into the grid. Combined with advances in technology and manufacturing, the residential wind turbine market is experiencing what many onlookers to the industry perceive as the beginnings of a boom industry. Particularly if you follow the forecasts of industry expert Darrell M. Dodge. The author of 'An Illustrated History of Wind Power Development', Darrell predicts, "In the near future, wind energy will be the most cost effective source of electrical power. In fact, a good case can be made for saying that it already has achieved this status". There are many variables to contemplate when installing wind turbines, other than just the climatic conditions of your local area. Installations require height, and if a tower is going to offend neighbors, then you may run into some speed bumps. Local planning regulations may also apply. But as a rough guide, if you feel that your home is suitable for a wind turbine, you can expect to break even in about 10 years. This may seem like a long time, but remember, from that point on your saving instead of spending money each year, so view it as a long term investment, or as an asset increasing your home's value. Furthermore, your contributing to a cleaner, greener America, saving the world no less, and what can be more rewarding than that?